One of the loveliest of the species Hippeastum papilio or ‘butterfly hippeastum’ is a native to South America (Brazil) and although the flowers may not be a big as some modern hybrids they really are striking flower (see picture right). This is an evergreen species and care is a little different to other varieties. 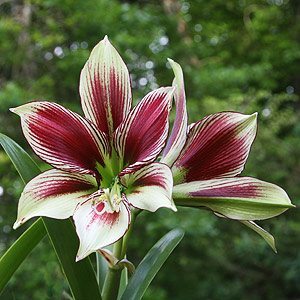 Hippeastrum papilio care is easy, and the flower is pale cream with dominant deep burgundy veins or markings with lime green make any effort worth while. And of course lots of hybrids are available but we think none as beautiful as the species. Flowering in late winter to spring Hippeastum papilio can easily be grown in containers or in the ground in a sunny well drained position. Like many bulbs they do not like to be moved, so let them be if they are happy and flowering. Bulbs are available in a induced ‘dormant state’ without foliage or as potted specimens. In most areas the ‘Butterfly hippeastum’ will remain evergreen, foliage may die back a little in summer. Remember to plant Hippeastum papilio with the bulb sitting high out of the soil, more above than below, this helps prevent rot. Protection from hot afternoon sun is recommended. Planting Hippeastrum Papilio in containers. Choose a large pot with some depth to it. Place a layer of scoria or other coarse stone in the bottom of the pot. Use a rich potting mix with extra compost added if needed. Fill the pot to the top with potting mix as it will compact down. Plant the Hippeastrum bulb with the neck above the soil level. Ongoing Care of Hippeastum papilio. Choose a position with good morning sun and afternoon dappled shade. Fertilise as soon as the flower shoot appears. Do not allow the bulbs to have a wet winter. 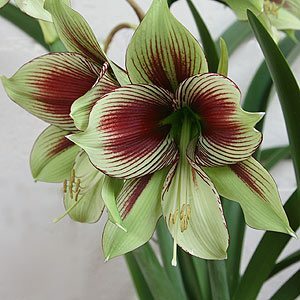 We hear stories of Hippeastrum papilio not flowering, especially in pot culture, one suggested approach is to give it a shock by letting it dry out a fair bit, cutting back the foliage in summer and then giving it a good soak in seaweed solution, we are working on this with some trial bulbs and will keep you posted. One of the few pests are mealy bugs, and if present they will prevent flowering, use a propriety spray or try soaking the whole plant in a liquid ‘coffee grounds’ bath overnight for an organic approach to best control. Another theory is that they like to be ‘pot bound’ many bulbs actually do and we have seen around 10 bulbs growing (and flowering) in the one pot. Pictured right is the flower from a pot of Hippeastrum papilio that had not flowers for 3 years. Here is what we did. and in November (Melbourne Cup Day) it flowered for us. and yes the flowers are lighter in the petal colour than our other specimens.